Another great entry from Arda, the Owl, and, as the author himself claims, a very Cassette 50 worthy entry complete with joystick support, fast action, and a great backstory! Earth is under attack by the great race of owls from outter space which are determined to destroy every living being, except for rats and frogs (maybe, methinks, their secret plans have to do with transforming Earth into some kind of paradise for frogs and rats – their cattle, which would provide a great food reserve for the owls). And, guess what – you are in charge of stopping them. You and only you alone in the fog, fighting those nasty owls yourself. And some of them take quite an amount of shoots to go down! There’s also nice bonus objects and upgrades and stuff which you must also shoot. In each wave, your ship is promoted to the centre of the screen and you can move vertically and shoot either left or right. Oh, my, this really sounds like a fun game, doesn’t it? Well – it looks like one, until the very moment you start playing. The ship moves too fast that it’s really hard to aim the ever approaching baddies. If you like getting frustrated, this is game is for you! 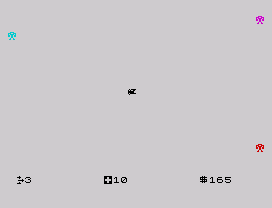 You can use the keys 6, 7, 8, 9 and 0 or the Sinclair Joystick on port 1 to control your ship. And I’m loving the usage of the word “or” in the previous sentence.